Ms. Karen's Kickin' Cornbread - A recipe from Savor California, the online showcase for extraordinary gourmet foods and beverages from California. If you have a favorite cornbread recipe use it; otherwise, our pick is Trader Joe's Cornbread Mix, which can be prepared with optional vegan ingredients. In a large mixing bowl, beat together egg, oil and milk. Stir in cornbread mix until just moistened. Add the Jenkins Jellies Hell Fire Pepper Jelly and cheese. Mix a little more. Pour batter into greased 8x8x2 pan and bake until golden brown, about 35-40 minutes. 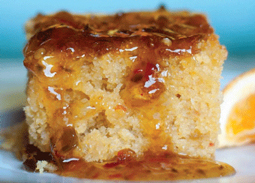 If you need even more heat -- brush some extra Hell Fire Pepper Jelly on top of the finished cornbread.